Why didn’t Obama go march in Paris? Because he can’t be on both sides of that fence. He’s spent his entire tenure as commander-in-chief defending Islam and apologizing for America’s role in violence around the world, and maybe just as important, it wasn’t all about him. Why share the stage? In line with certain words & phrases being banned by Nobama’s administration (jihad, Islamic terrorism, etc. ), his upcoming summit is focused on violent extremism, not Islamic extremism. WTF? After reading an article from Zero Hedge recently I can guarantee you this summit will result in more lost liberties by Americans as government sees an opportunity to clamp down further on free speech, communication, right to assemble, the right to bear arms and protect ourselves and our families. What criteria will be used to determine who or what is “extreme”? Wikipedia says “extremism” is an ideology (particularly in politics or religion), considered to be far outside the mainstream attitudes of a society taking many forms political, religious and economic”. 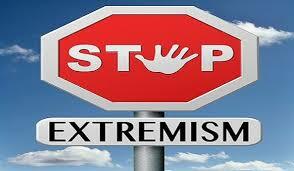 But for elitists such as Barack Obama, the word “extremist” has a much broader meaning. It’s become code for those that do not have an “enlightened” view of the world. If your views on politics, religion or social issues are extremely different from the liberal, progressive views of the mainstream media and Washington elites, then they consider you to be an extremist. Think I’m crazy? Here is a list (again from Zero Hedge, complete with back-up references) of just a few of the types of Americans considered to be “extremists” or “potential terrorists” in official U.S. government documents. Now do you understand why there is nothing good that will come of this summit to counter violent extremism? How many of these categories do you fall into? At least a few I’m guessing, so get ready for what’s coming down the pike. This entry was posted on Wednesday, January 14th, 2015 at 9:21 am and is filed under Islam- the religion of peace, Updates, WTF?. You can follow any responses to this entry through the RSS 2.0 feed. Both comments and pings are currently closed.